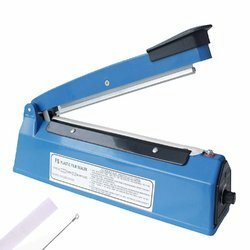 Offering you a complete choice of products which include manual heat sealing machines, heat sealing machine 12 inch, manual hand sealer, electric hot sealing machine, plastic bag sealing machine and heat sealing machine 8 inch. 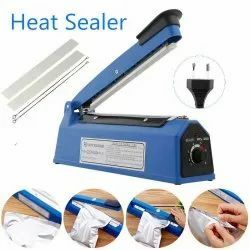 The hand sealer creates a seal that keeps products safely and securely it in the bag. Use to package a wide variety of products. These simple yet rugged machines use a timer to regulate the seal cycle, thus assuring that all bags are sealed equally, without the need of constant operator supervision. A typical seal takes only a fraction of a second. These powerful units will seal most small bags, including those made with Polyethylene, Polypropylene, Polyvinyl Chloride, Cellophane, Polyolefin, and Laminations (even those with a metalized layer). These machines are used to seal: Sachets, Pillow-type bags, Pouches, Dog bags, Gusseted bags, etc. The hand sealer creates a seal that keeps products safely and securely it in the bag. Use to package a wide variety of products. These simple yet rugged machines use a timer to regulate the seal cycle, thus assuring that all bags are sealed equally, without the need of constant operator supervision. A typical seal takes only a fraction of a second. These powerful units will seal most small bags, including those made with Polyethylene, Polypropylene, Polyvinyl Chloride, Cellophane, Polyolefin, and Laminations (even those with a metalized layer). These machines are used to seal: Sachets, Pillow-type bags, Pouches, Dog bags, Gusseted bags, etc. It can be used to seal bags. Food products: Seal your homemade pastries, cookies, cupcakes. Favors: Seal your party, wedding, and shower favors. Industrial: Frequently used in the food & beverage industry. Bag all your merchandise properly; it gives your customers a clean professional feel with a better appealing presentation of your items. Automatic & Easy to Operation---One-touch automatic vacuum sealer operation with intelligent LED indicator lights. 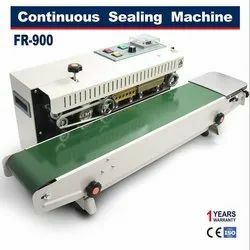 Sealing and vacuum sealer function can be operated separately. 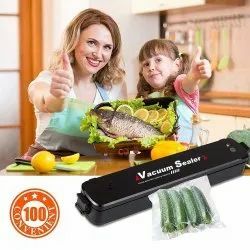 The vacuum food sealer uses exclusive technology to automatically sense the bag and food-type to create perfect, air tight vacuum seal,which can free your hands. Health Assistant---Food vacuum sealer can eliminate invisible damage ,keep your family healthy. 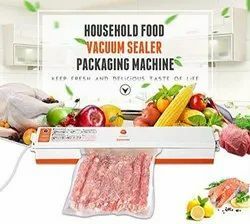 Many bacteria can survive at low temperatures and cannot be identified by smell or taste if the food couldn’t preserve better, Vacuum Sealer Machine can solve this problem well and provide a good food preservation. Versatile Vacuum Sealers---Automatic Food Sealer Machine is convenient for food fresh preservation, which a good assistant to save the space, keep the clean and dry for kitchen. But it not just a food saver machine, it’s also suit for preserve valuables, jewelry, Painting, photos, even important documents. Preservation time---Vacuum preservation is 5-10 times longer than ordinary preservation. We offer a three-year warranty. If you receive a defective product, we will re-deliver a new product for free and provide technical guidance for a long time. Superior material---The core components of vacuum sealer food packing machine use imported heating strip and sealing element, and even the small gaskets of the vacuum sealer accessories are made of imported rubber. We always value product quality.